Aerial shell burst height data is perhaps one of the more interesting and important pieces of information that an artistically minded display designer needs. Unfortunately, this information has generally not been available and has essentially never been reported in the technical fireworks literature. One of the authors recently published an article suggesting a simple design for an instrument to collect burst height data. Another author fabricated an instrument based on that design, and now offers similar instruments (Pyro-Meter II) for sale to the industry. This article reports on the first use of the instrument to collect burst height data for commercial aerial shells. This article is a slight modification of an article originally prepared for the International Association of Bomb Technicians and Investigators. Because much of this same material is of interest to the fireworks community, this article was offered to the PGI Bulletin. However, in order to enhance its usefulness, some additional material was included and other sections were rewritten. Reprint Information: Number of pages = 10. Download for free pp 128-137. Reprint Information: Number of pages = 12. Download for free pp 138-149. In recent months, the authors have received a surprising number of requests for sources of chemical hazard information. Perhaps this is a consequence of the industry’s increasing concern for health and safety. Whatever the reason for the requests for information, the authors have prepared this article to assist those needing to locate reliable and practical hazardous chemical information. Reprint Information: Number of pages = 4. Download for free pp 150-153. From time to time there is speculation regarding the performance characteristics of visco fuse under various conditions. This article presents the results of a brief study of this topic. The fuse for this study was purchased from American Visco Fuse in 1989. While it is likely that visco fuse from other manufacturers will perform similarly, that has not been verified. Reprint Information: Number of pages = 5. Download for free pp 154-158. Saran™ resin in its most common form is Saran Wrap™, the original plastic food wrap manufactured by Dow Chemical. Technically, Saran resin is polyvinylidene chloride, which has the chemical formula of: [CH2·CHCl2—]n.
Polyvinyl chloride (PVC) has the empirical formula of: [CH2·CHCl—]n.
Reprint Information: Number of pages = 1. Download for free pp 159-159. Over the years, we have had occasion to work with a fairly large number of different fuse products. One of the more important characteristics of a pyrotechnic fuse is its burn rate, but often that is not specified by the supplier. Thus, when we have had a large enough supply of a type of fuse to make an accurate determination, we measured its burn rate. To do this, three pieces of fuse, 36 inches in length were prepared. Then, using a stopwatch, the time taken to burn each piece of fuse was measured, and the average determined. For future reference, these values were recorded, along with burn times (in seconds per inch) and burn rates (in inches per second). 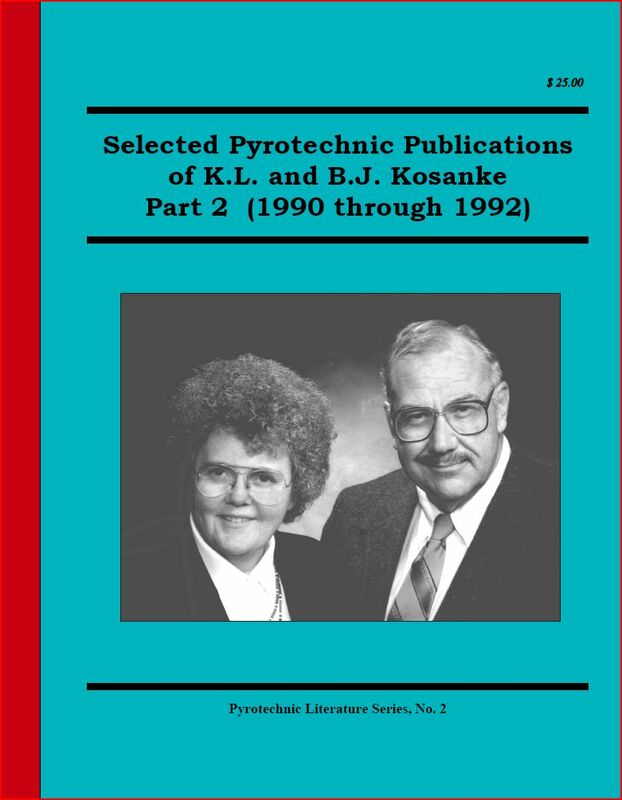 We had not given the matter much further thought, until, following a lecture on the “Identification of Pyrotechnic Devices,” we received a number of requests for that information. Unfortunately, the data was scattered throughout several notebooks, and not in a form ready for distribution. In order to fulfill our promise for the data, we compiled the table following. With the thought that there might be others wishing the same data, this brief article was prepared. At one time, we were engaged in the commercial manufacture of stars. During that time we assembled (developed, borrowed or modified) a series of star formulations. It was felt that the formulations were reasonably safe and cost effective, while at the same time, performed well (relatively easy ignition and fairly good color or comet effects). Over the years, when asked for advice concerning useful star formulations, we frequently supplied copies of these formulations. In the thought that there are others that might wish to have access to them, this short article has been assembled. Reprint Information: Number of pages = 2. Download for free pp 162-163. The use of copper(II) benzoate as a blue color agent was discussed by Bleser. In large part, the endorsement for its use is based on its ability to serve as both color agent (copper) and fuel (benzoate). There is something to be said for this approach. For example, consider a color agent such as copper(II) carbonate (CuCO3); it is only the copper that is useful in producing color. What is more, energy is required to free copper from its carbonate ion. Consequently, the flame temperature is lowered, which in turn results in less colored light output. It would be preferred if the copper could be made available without having to pay the full energy cost of freeing it from the carbonate ion. One way to do this is to chemically combine copper with a fuel such as the benzoate ion. Then, when the fuel is consumed, copper will be left over and ready to make the blue color-generating molecule, copper monochloride (CuCl). Because copper benzoate is not commonly available, Bleser described one way to produce it. There is, however, another way to produce copper benzoate. This process is a little more complicated, but the same basic process can also be used to make many other interesting pyrochemicals, only one class of which are benzoates. Reprint Information: Number of pages = 3. Download for free pp 164-166. In effect, there are two basic mechanisms for pyrotechnic burning. One, which is primarily burning inward, perpendicular to the burning surface, and one in which accelerated burning along surfaces is most important. These can be termed “parallel” and “propagative” burning, and the same pyrotechnic material can manifest radically different burn rates depending on which type of burning predominates. A theoretical discussion of burn rates and the many factors effecting burn rate is beyond the scope of this article; however, a working knowledge of these two types of burning is useful in understanding the way in which a number of fire-works items function and, on occasion, malfunction. Also, should the need arise to dispose of pyrotechnic materials by burning, a knowledge of these two types of burning, and the potentially dangerous transition that might occur between the two, could be of critical importance. Reprint Information: Number of pages = 7. Download for free pp 167-172. There are times when it is of interest to measure propagation rates in highly energetic pyrotechnic materials, such as flash powder. These rates tend to range from less than 1000 to about 5000 feet per second. Conventional means of making such velocity of propagation (VOP) measurements involve the application of techniques developed for use with high explosives in order to make velocity of detonation (VOD) measurements. Some examples of the equipment used are high speed framing cam-eras, streak cameras, continuous velocity probes, and any of the various so-called “pin” techniques. These approaches require expensive instruments and in some cases may not be entirely reliable in the lower reaction pressure regime of pyrotechnics, especially when weakly confined. Reprint Information: Number of pages = 6. Download for free pp 173-178. High Density Polyethylene (HDPE) mortars are beginning to find wide use because of their desirable characteristics. They are relatively inexpensive, lightweight, have a long service life, and some consider them to be among the safest mortars presently in use. Initially HDPE mortars were only recommended for use in electrically fired displays, where each mortar is fired only once. This was done because of a desire to take a cautious approach with this relatively new mortar material, even though the mortars had successfully passed some repeat firing tests. Now, it is becoming increasingly common to use HDPE mortars for manually discharged displays, in which individual mortars are fired repeatedly. The mortars heat up during firing, and, being a thermoplastic, they lose strength with increasing temperature. If mortar temperature rises sufficiently high, they will burst during use, venting the lift gases needed to propel shells to safe altitudes. To date there has been no systematic study of HDPE mortars under conditions of repeat firings, in order to determine the safe limits for their use. Thus it is appropriate to more carefully examine the performance of HDPE mortars under conditions of repeat firing and to offer guidance for their use. Measurements were made of the thermal energy deposited in a mortar during the process of firing 10.2 cm (4 in.) aerial shells and of the distribution of that thermal energy along the length of mortars for typical aerial shell firings. Then, measurements were made of the rate of heat dissipation from HDPE mortars freely exposed to air and when buried in dry sand. Finally, data was collected regarding the ability of HDPE mortars to survive shell firings as a function of temperature. With this information, very rough guidelines are proposed for repeat firing of thick-walled, 10.2 cm (4 in. ), SDR–17, HDPE mortars. Reprint Information: Number of pages = 12. Download for free pp 179-190. A prime consideration in determining separation distance requirements for aerial fireworks displays is where fallout of dangerous debris is likely to occur. Certainly the most dangerous single piece of fallout is a dud aerial shell. Thus it is important to have knowledge of where duds may fall during typical displays. This would be a relatively simple situation if aerial shells were ballistically stable, and they precisely followed the path determined by mortar orientation, shell muzzle velocity, and atmospheric conditions. Unfortunately, however, aerial shells tend to drift from their ideal (predicted) path, and that drift is greater than most realize. In order to determine where dud shells fall, a large number of aerial shells, both spherical and cylindrical, were fired into the air after having been rendered incapable of bursting at altitude. Most firings were from mortars that were positioned vertically and under calm wind conditions; however, some firings were from angled mortars. For spherical aerial shells, 7.6 cm to 25.4 cm (3 in. to 10 in.) it was found that, on average, duds fall 3.8 m per cm (32 ft per in.) of shell size, from the point ballistically predicted. Further the data suggests that drifts as great as 12 m per cm (100 ft per in.) of shell size may occur nearly 1 percent of the time. For cylindrical shells, 7.6 cm to 15.2 cm (3 in. to 6 in.) it was found that, on average, duds fall 2.4 m per cm (20 ft per in.) of shell size, from the point ballistically predicted. Finally, a large number of 10.2-cm (4-in.) cylindrical shells were fired in order to determine the effect of shell weight, shell length, and lift powder weight on drift distance. If one has a reasonably accurate computer model, it is usually appropriate (cheaper and faster) to rely primarily on modeled results, supplemented with limited experimental results. The case of aerial shell ballistics is no exception. The mathematical basis for such a ballistics model is derived, and the simplifications and assumptions of the model are considered. The necessary input parameters are developed and some modeling results are presented. Finally, the use of the model is demonstrated by performing a series of calculations, including the effect of mortar tilt angle and wind speed. Reprint Information: Number of pages = 13. Download for free pp 203-215. Conventional accelerants used in arson crimes, such as gasoline, readily burn in air producing flame temperatures of about 3000 °F. Yet these accelerants generally lack the ability to produce major involvements in short times. This is because, like most combustion reactions, they must rely on a continuing supply of air to provide the needed oxygen. Thus, even when there is a large amount of accelerant, it is of little value unless there is a corresponding large supply of fresh air. Reprint Information: Number of pages = 1. Download for free pp 216-216.